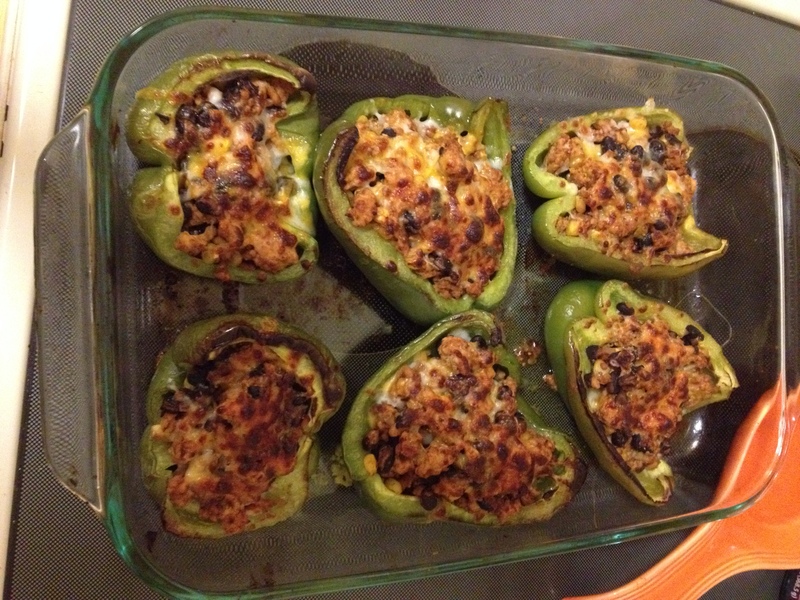 I made these delicious stuffed peppers on Monday after a friend provided me with the recipe…thanks Jess! You should all check out her blog Rookie Running Life; she posts lots of healthy recipes, running tips, and more! The peppers were super easy, and I liked that they didn’t have rice because I didn’t have to spend a lot of time cooking the stuffing. It also makes them pretty low-carb. Genius! One half of a pepper along with some fruit was filling enough for me. I also tried one with salsa on top and it was really good! I did have about 1 1/2 cups of stuffing leftover, so you could either make an extra pepper or save the extra stuffing to put on salads (which I did). 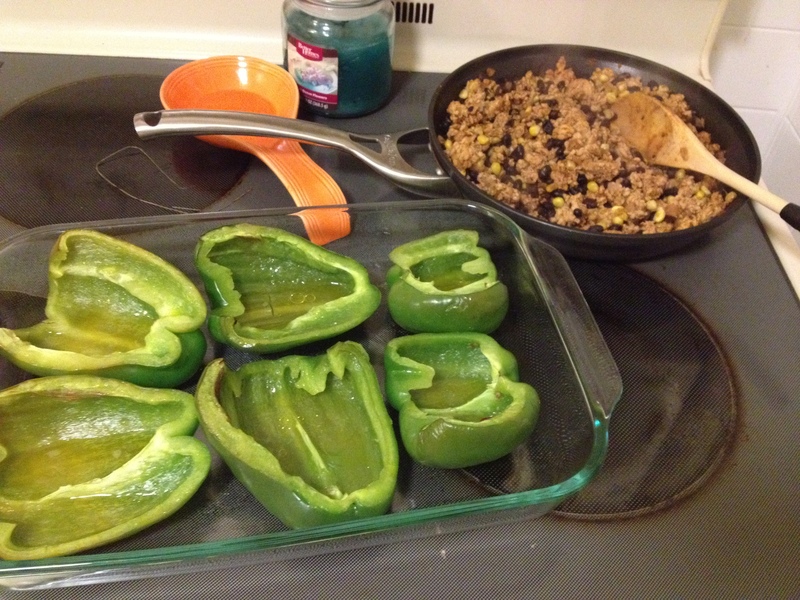 Delicious taco salads plus stuffed peppers = win. Enjoy! 1) Spray a casserole dish with cooking spray. Place pepper halves in the dish, facing upright. Bake them at 375 degrees for 20 minutes. 2) While the peppers are in the oven, drizzle some olive oil on a skillet over medium heat. Add onions and cook until soft. Then add in the ground turkey and cook through. Add the taco seasoning once the turkey looks almost done. 3) Add the beans and corn to the turkey mixture and cook for an additional 5 minutes or so. 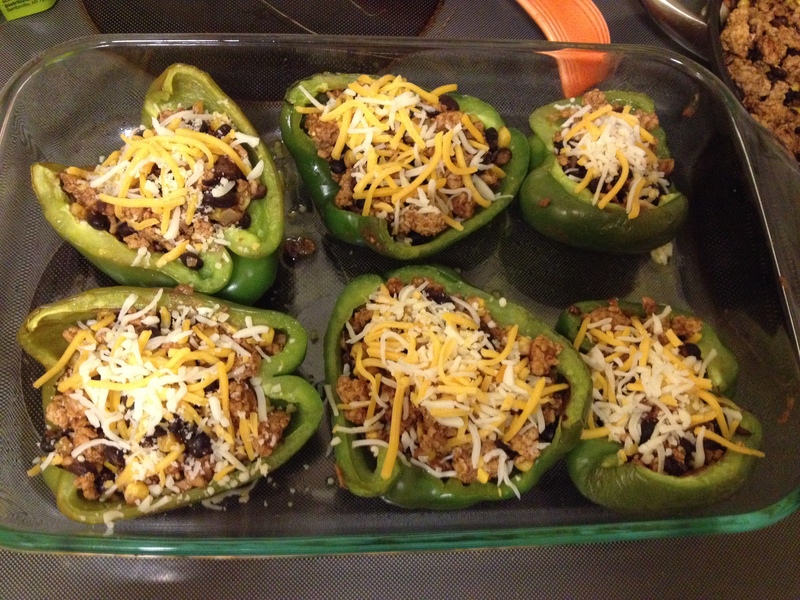 4) Scoop your turkey stuffing into the pepper halves and sprinkle a good heaping of cheese on top. Place in the broiler for about 3-5 minutes, until bubbly. Watch them to make sure cheese doesn’t burn!